This poised pooch is rendered in cloisonné enamel and 22-karat gold. He likes to fetch, while his human likes to look fetching. Show your love for a canine companionship with this adorable dog pendant. 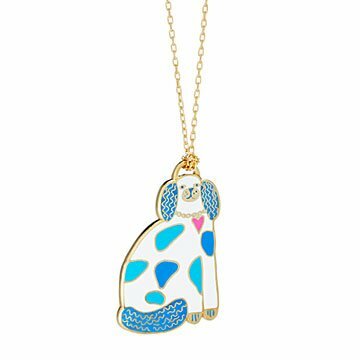 Rendered in cloisonné enamel and 22-karat gold and suspended from a gold-dipped chain, this poised pooch makes a charming addition to any dog lover's collection. Designed by Christine Schmidt; made in San Francisco. Make it a set! Click here to see the matching Cat & Dog Mismatched Earrings. The perfect, fun addition for layering or for wearing alone if you love dogs as much as I do!! I love this necklace so much!! !